As our resident Instagram Agony Aunt, Sara Tasker of @me_and_orla answers your burning questions, and helps demystify the secrets of great content creation. The short answer is yes - in fact, it's probably one of the best ways to go about it. One of the things about Instagram that is simultaneously joyful and a little frustrating is its heavy visual focus. For most of us, it's the main reason we're there: to soak in visual inspiration, beautiful imagery and catch up on the details of our friends or favourite company's day. If Facebook is for connecting with real life friends, and Twitter helps us connect with strangers through words, then Instagram is the place where we can reach out and forge new connections and relationships using a visual language - finding the things we have in common based on shared taste and imagery alone. I say it's 'frustrating' too, because this comes with its own limitations. While a picture may speak a thousand words, it blabs them out incredibly quickly. Fail to grab your viewer's attention in the sea of other photographs in the app, and you risk all of that visual messaging falling entirely on deaf ears (or eyes!) before they've even glanced at your caption. In fact, with our posts' reach increasingly dictated by algorithms and audience response, it's never been more important to deliver striking visual imagery and a really coherent brand voice is you want to reach an extended audience and have any sort of measurable impact. 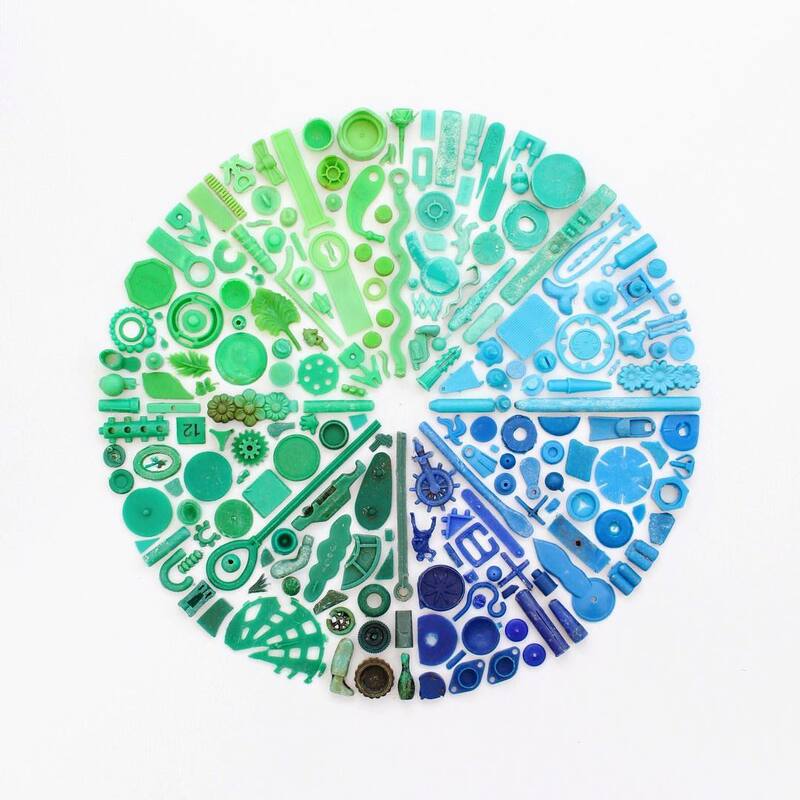 Content creator @caroline_south regularly curates work through manipulating beach waste into beautiful pieces. When we're tackling the "ugly issues" or using our pages to try and make social change, getting those eyes onto our captions and feeling inclined to hit follow is more vital than ever. These accounts are, by nature, a harder sell - however virtuous and concerned our audience may be, it will always be more of a no-brainer to commit to seeing fashion or uplifting lifestyle posts in your feed every day. Beautiful imagery, then, and an irresistibly curated gallery are a way of sweetening that offer - the sticker after the dentist trip, the milkshake after the gym. These elements say, 'look, this is for you, and it can be a part of your life alongside all the things that you love'. Whether it's tackling inequalities, prejudice and discrimination, or opening up discussion about political or environmental issues, we know that real change happens most when conversations are raised in this open and integrated way. @nnekaj reclaims her label with River Island. Isn't it galling, though, that such important topics need the window dressing of a pretty Instagram photo in order to make an impact? I'm sort of on the fence on that one. Yes, in an ideal world we'd all pay the time and attention to these issues that they truly deserve, but we're also fortunate to have free platforms like Instagram that give us space to work around that. All of this isn't to say, though, that your beautiful imagery cannot reflect the issues. While some obviously lend themselves better to attractive imagery, with creativity, consideration and care it's often possible to weave an element of the story into your shot. Dominique of @allthatisshe's new #projectlittercritter is the perfect example - born of her daughter Penny's dismay at the plastic in the ocean, it's become a whole family pursuit that combines recycling, awareness of plastics, and her recognisable visual flair and playfulness. @laurathomasphd has photos of herself meditating with donuts and talking into bananas whilst tackling the heavy (and surprisingly divisive) topics of diet culture, body positivity and the bad science messaging around food. [@oteghauwagba](https://www.instagram.com/oteghauwagba/?hl=en) has a glorious feed full of flowers, books, and travel destinations but simultaneously tackles issues such as catcalling, race, money stigma and abortion. Will you put some people off if you speak about these sorts of topics? Undoubtedly. Will there be people who only follow for your pretty pictures and choose to opt out of responding to your words? Sadly, yes. But is it possible to make an impact and still honour your creativity, to care about the world and an aesthetic, and to mix the good with the bad? I'd say that's the secret to living, really, and there's no better time to start. Do you have a question for our resident Agony Aunt? Leave a message anonymously here.